The official invite of the day. What is this FTalent all about you may ask? Well, I'm thankful to be invited to witness what it actually is, thanks to Bob for having me at such a playful event at one of the FTalent series. From what i've been told, FTalent is where the arts and business meets, which means you don't even have to have an acting background to join! In short, it generally means that FTalent communities would learn that acting techniques can improve communication skills as well. Bob Morshidi, Head of CODE School, taking over the mike, while breaking the ice. The event started off with some fun activities where Bob Morshidi, the head of CODE school, decided to break the ice a little with guest who were coming over for the first time. And even i was in the scene, managed to make new friends too! Nothing to lose there. The activity was to start a story and your partner continues the story using the words yes followed by yourself saying yes too. Really challenged my creativity there, but it was a fun exercise! Some attendees who were going through activities of story telling. Bob Morshidi taking the mike who was happy to get the energy rising in the room. So thats lesson number one to start the class, and Bob really did a great job getting the room filled with positive energy and hype to start off with. 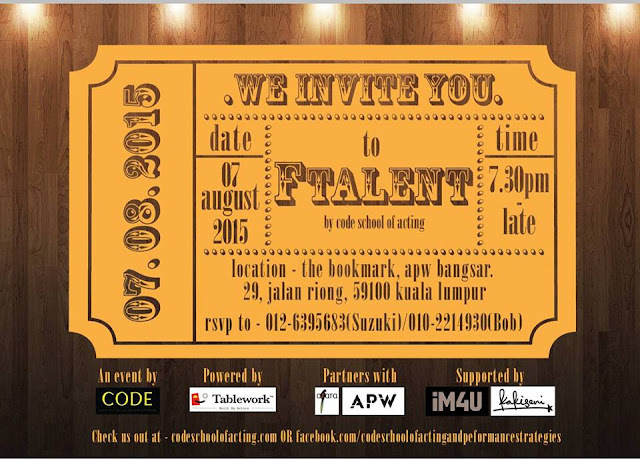 And since everyone was all pumped up for the next session, we had Razif Hashim, the founder of CODE school to further explain to attendee's whats FTalent is all about. He has successfully developed a series of acting programs which provides an introduction of what a typical Thespian would learn during their years of training. And he aims to create scenarios that are related on how corporates should communicate during presentations and sales pitches (Pitches, you should really try FTalent out to improve on your pitching skills). Razif also believes that FTalent is suppose to dissipate the idea that an entertainer requires 'talent' in order to succeed in the industry, through learning the right techniques. Jojo Struys supporting the arts industry, sharing her experience on how acting has built her confidence. Mr Ee Soon Wei, the founder of APW Bangsar, supporting the arts industry as well. Even the founder of the venue host, Mr Ee Soon Wei, the founder of APW Bangsar had a say to support the arts, where he said "As a strong supported of the arts, I believe that FTalent is a great program because it invites the local community from various backgrounds to have an introduction on acting and performing for free". And i have to agree with what he said, FTalent is amazing to be giving a chance to experience the world of performing arts for free. Thats me in the scene too! Some active movements happening during the class. From the photos above, here we have Razif Hashim conducting a simple class to emphasise on the control of movement that you can achieve. From simple walking to a faster pace of making sure attendees fill up an empty space, it was amazing how in such a fast moving environment, we were able to avoid from bumping into anyone! (EXEPT for one or two people of course) Teehee. Razif Hashim shared about the latest app, Tablework. "As a trained actor, I often found it difficult to develop notes for my character on paper. On top of that I had to use various platforms to communicate with my cast members. But now with Tablework, I can upload my script, copy links on the internet and share my notes and discuss with my cast members about scenes we need to work on." says Razif Hashim who is also the founder of Tablework. 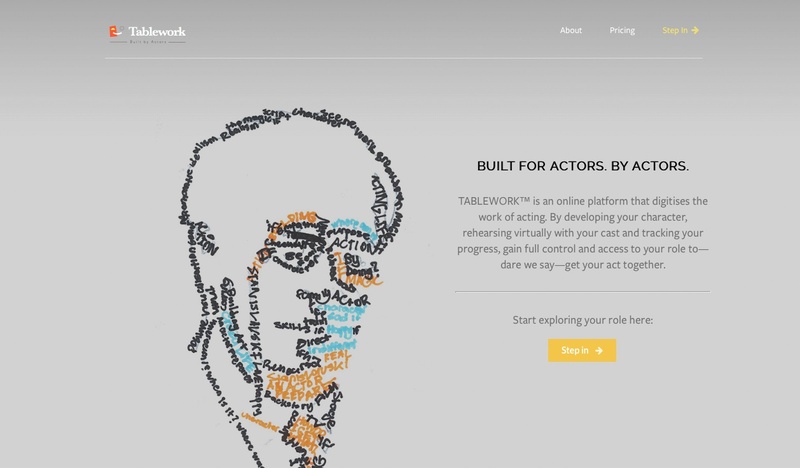 Tablework is built for actors, by actors. The Vision, Mission and Definition. 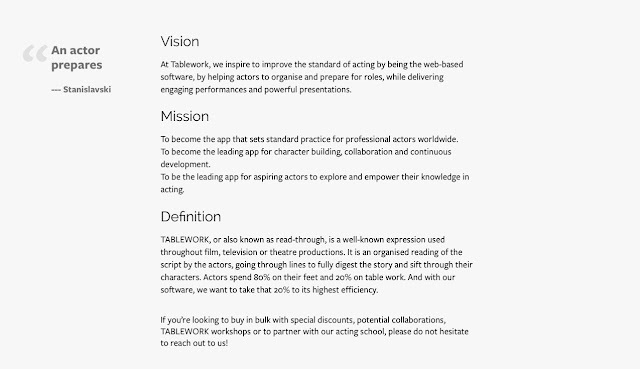 ALSO, theres a new app launch called Tablework which will assist actors in improving their role during performance. The app functions as a character management tool for actors to prepare for their role during their performance. So why not give it a go, as Tablework is free to try up to three characters and has a paid monthly fee for those who wish to use more. 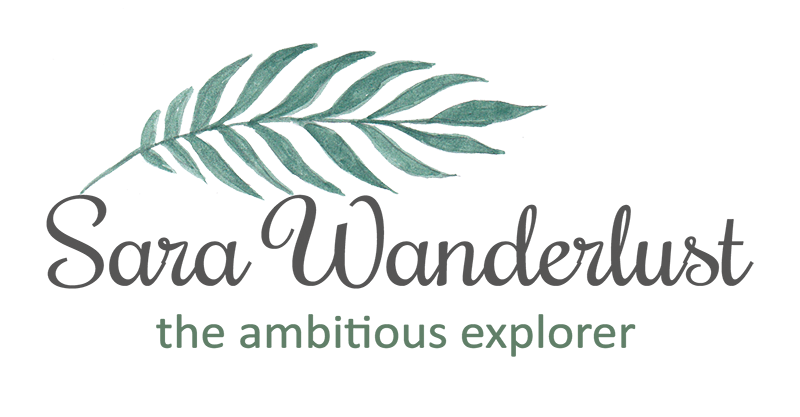 So do check it out if you're into the world of performing arts as this might be the future of of educating techniques and you're one of the first few to discover Tablework! 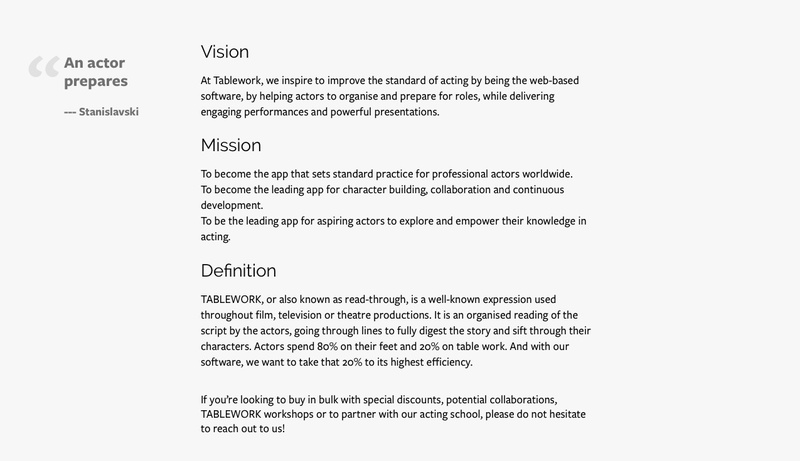 For more information on Tablework, do head over to think link here, http://www.tablework.com. A mandatory picture with the backdrop. Some fun and energetic attendees today. From meeting friendly faces to learning more about yourself, there was really noting to lose when you join the FTalent class. As of August, FTalent now runs twice monthly at APW Bangsar between 8pm - 10pm and holds around 30 students at a time. Students can also obtain more private lessons or corporate training upon request too! Classes on FTalent will be updated on their Facebook page, so be sure to like them on Facebook ok? OK! with 10 years of international experience and exposure in the performing arts industry. Their school quantify students creative process by using cutting edge technology in their method. Well, i think thats about that. I wouldn't want to be too draggy, but if you do have any question, do not hesitate to leave a comment below and i'll be glad to answer them for you! For more information, please do check out the links below to keep yourself updated. whoa! can learn many things here. The participant look so enjoy the class. Wow.. Great experience I am sure... Looks like lots of fun!!!! !